Pictured left is Joseph Rethemeyer and James Eads who purchased his pig. Pictured right is Hannah Rethemeyer with Mark Wessels who purchased her pig. Hannah and Joseph Rethemeyer would like to thank Mark Wessels of the Washington Town and Country Fair and James Eads of JE Designs for purchasing their pigs at this year's Washington Town and Country Fair. JE Designs specializes in Custom Paint Vinyl & Designs, located in Leslie, Mo. 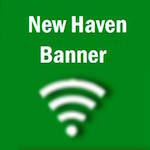 Joseph and Hannah are both members of the New Haven 4H Club.